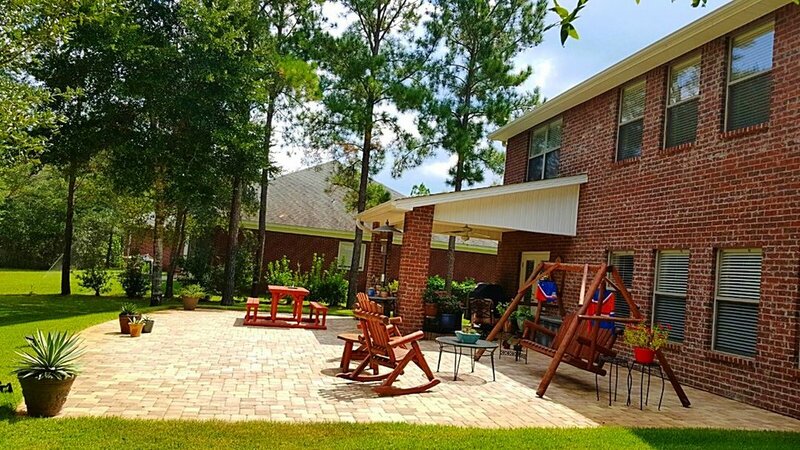 When driveways, patios, retaining walls and walkways are made of brick, the value of the home is always pushed skyward – nothing matches the beauty of brick laid out in an intricate pattern. Even a simple brick driveway outshines the best asphalt or concrete slab. Brick is not just for the siding of the house, it can complement any home style and improve the curb appeal and overall value of your large investment! Homebuyers’ expectation aren’t limited to the interior – homebuyers also insist on landscapes that please. According to Floyd Calhoun, a large residential developer. “The surrounding area has to be attractive. 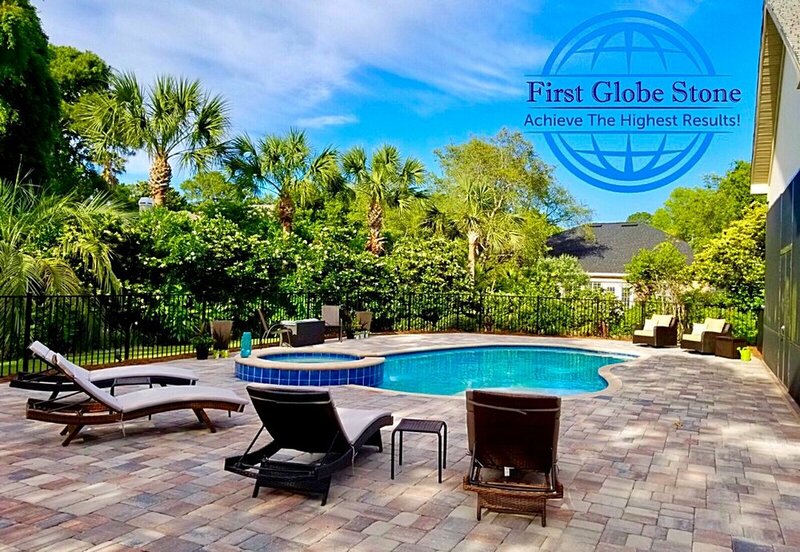 With First Globe Stone retaining walls, the style, aesthetics and quality are all there. Make your Old Pavers look new again! Applying a sealer to your pavers can make removing stubborn stains such as oil, grease and rubber stains so much easier. If your pavers are sealed these substances do not have the ability to soak into the surface of the pavers, therefore all you need to do is wipe them off with a rag as soon as you notice them, and that’s it! If your pavers were not sealed your paved driveway could start to look very tired and dirty after a while. This is a process consistent of few steps and finishing with sealer application. Enhance the Look of your Pavers Sealers can provide a top coat that will enhance the color and texture of your pavers. Let’s say you have installed stunning natural stone pavers and you want to enhance all the natural colors in the veining and specks of the stone, a sealer can do this! Protect your Pavers Sealers can also provide a protective layer for your pavers. This will help maintain your pavers in harsh weather conditions or high traffic areas. Sealants can protect pavers from the effects of wear and tear. Remove Stains (The first step on this process Steam Pressure Wash will help removing Stains, Mildew and Bacteria’s from your pavers). Handcrafted Concrete Pavers. 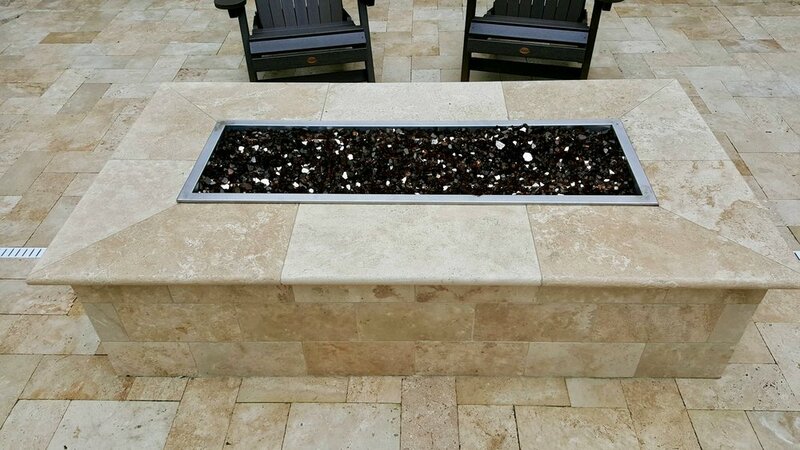 The beautiful, timeless look of natural stone! From patios to pools, from water features to walkways, Peacock Pavers bring old world elegance that only looks expensive. Bring the timeless look of natural stone to your next construction, landscaping or remodeling project with Peacock Pavers! Excellent for both indoor and outdoor settings, these handcrafted pavers lend realistic Old World elegance to floors, terraces, water features, decking, driveways and much more, but without the excessive price tag of their natural stone counterparts. Despite walls and furniture getting a lot of attention, the floor is what sets the mood in an area. It needs to look great, but must also be easy to maintain, durable and practical. Stone and tiles are excellent for all kinds of buildings, from small homes to large commercial establishments. Travertine tiles are some of the most exquisite flooring materials available. They have been widely used for centuries and are still a great choice for your home’s floor. In fact, they create an elegant ambiance in any building’s floor. Being versatile, they can be used both for residential and commercial flooring purposes. Brick pavers can be used in a variety of settings, including driveways, walkways, patios, pool areas, gazebos and greenhouses. The natural beauty of brick makes it an often-used choice for paving outdoor areas. In addition, brick is weather resistant and durable, easy to install and maintain, has a low cost of ownership and is environmentally friendly. Although brick is more expensive than concrete, the cost of ownership for brick pavers is substantially lower. Repairing a brick sidewalk is 10 to 30 times less expensive than repairs to concrete. Concrete may require three to five days after installation before the area can be used. However, with brick pavers, there is no need for a curing period, so the area can accommodate traffic immediately following installation. Brick paving is more durable than poured concrete because the bricks can adapt to movement and changes in the soil and environment, which prevents the formation of cracks. Brick paving is also easy to maintain and can be cleaned with a scrub brush, soap and water. Brick paving can last more than 25 years while maintaining its color and experiencing minimal deterioration, and the website Paver Search states that there are streets in Boston paved with brick that are more than 200 years old. 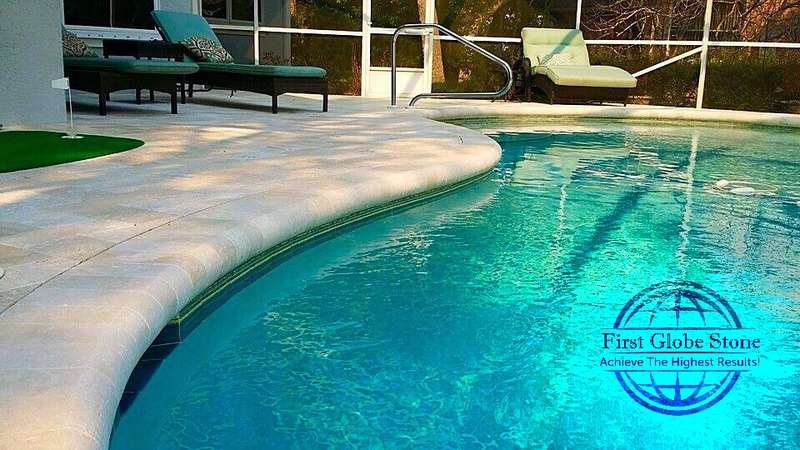 Brick pavers are slip-and-skid-resistant, which makes them a good choice for installation near swimming pools and other wet, high-traffic areas. Also, unlike concrete, brick pavers are environmentally friendly, allowing rainwater to permeate the soil. Brick pavers are also recyclable, and in the event of repair, only the damaged brick paver has to be replaced, compared to removing large sections of concrete and then mixing and pouring new concrete.